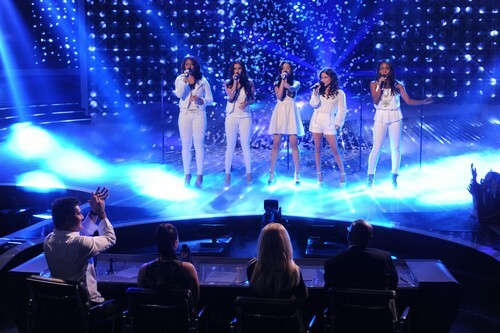 Fifth Harmony took the stage tonight on THE X FACTOR USA for his Top 10 video performance. Fifth Harmony sang “I’ll Stand By You” by The Pretenders. Tonight’s show the top 10 performed live in front of coaches Simon Cowell, Britney Spears, Demi Lovato and AJ Reid for America’s vote and to make it another week. The Top 10 will sing about thanks, gratitude, and inspiration. That also means lots of ballads, emotional performances, and special dedications to those they are most thankful for. Did you miss tonight’s episode? If you did we watched it and we recapped it here for you. On tomorrow’s result show, tune in for a special Thanksgiving night episode with a performance by Brit teen sensation Cher Lloyd. Then, Khloé and Mario will announce the acts that made the cut in an all-new “Live Results” episode. Check out the video below and let us know what you thought of Fifth Harmony’s performance? Was it enough for them to make it through for another week? Sound out in the comments below and let us know your thoughts. Who Got Voted Off The X Factor USA Tonight 11/15/12?